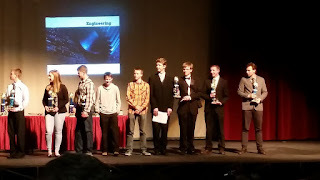 I'm sitting in a large high school auditorium, listening to a very dynamic announcer read of the names and awards of state science fair projects. The kids here are in junior high and high school, so many of the projects are over my head. I don't even understand all the words in their titles! A huge amount of research and hard work go into these science projects. Chris and his friend have already won a specialty award from NASA. I'm impressed with the depth and and scope of their research, but I can't sum it up for you very easily. Chris has such a brilliant brain, and his thoughts are progressive and well ordered. I'm so peeps of him! I'm sure I don't tell him that enough, but it's hard for a mom to say mushy things like that to a teenage boy without eye rolls and embarrassment. But I am proud of him, and impressed with how he is growing up. He is graduating this year, but I'm not sure how that happened. He will find his own place in the world, and do well at the things he throws his heart into. And now I'll quit, before we all die of mortification. Love you, buddy! 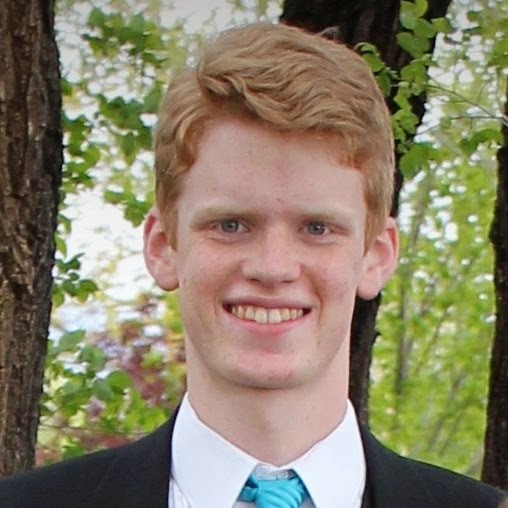 I wrote two letters to my missionary boys this week - for the last time. It's hard to believe that Alec's two years has come to an end, but he really will be home this week. I'm pinching myself. I know he won't want to stay home once he gets here - what motivated young adult would rather stay home and be bored over getting out and on with their life? But I'll enjoy just sitting back in the corner and seeing him interact with everyone. I've missed his self-assured confidence, his loving tenderness with our small fry, and his mischievous dimple. He reminds me so much of his cheerfully brilliant dad. I've been blessed to be surrounded by such amazing men. The blogs: Madagascar and South Africa. So the other day (which means a vague sometime in the past but not necessarily recently. We're liberal with our definitions here) I wrote about getting an inspiration in the temple that I needed to slow m life down. I tried! I thought seriously about it and everything. But the reality of life for me is that I am the Mama of a large family. Six kids at home rely on me for food, clothing, love, and attention. I am the homemaker in charge of a house and land. It's not huge, but there are always things that need cleaning up, fixing up, taking out, and tuning up. I am the primary caregiver to a wonderful man and his Parkinson's Disease and he's not improving. This disease is slowly stealing him and his abilities away from us. And not lastly (but bestly!) I am the wife of a good man. I'm so lucky to be the one to love him. None of this will let up. In spite of the fact that we cleaned the front room yesterday, it needs to be cleaned again. The laundry does not stay folded and put away. Kids need to go to school again. Track practice got out late and the boys need a ride home. He needs a new pair of shoes. She needs her hair brushed. They need dinner (seriously guys? We just ate yesterday! Can't we call that good?). And in the middle of all this thinking about slowing down and realizing that life was just not going to make this easy for me, I got a phone call from the doctor's office. "So sorry, sweetie (she always calls me that and I love her for it). The blood test results came back and you have Epstein Barr. You need to get your back on the couch and stay there until this flare settles down." Wait, what? What is it, exactly? Didn't I have mono already when I was twelve? It comes back? How bad is that? How long will it take? "Probably a month until you start feeling a bit better, but the fatigue can hang on for a while." The fatigue. Oh, I remember that part. I was too sick to go to sixth grade for weeks. My mom would take me to the doctor's office for more tests and I'd still be panting when we got there from the exertion of walking out my front door to the car. Sometimes I had to crawl down the hallway to the bathroom because I was too exhausted to walk. I lived on the old hide-a-bed couch in the living room where Mom could keep an eye on me. Then they got new blue couches and they moved me and my old brown plaid one under the peninsula counter in the kitchen. I was always so tired and never even wanted to move. And I get to do that again? Oh goody. So now I live on the couch again. Sometimes in the front room, and sometimes on the squishy green couches in the back room. And sometimes I hide in my bedroom while Trent makes dinner and David hosts his own birthday party with his friends. Lots of times I get up and do things, which I thnk is ok - in tiny amounts. Because if I do any more than a microscopic amount, I pay for it afterwards. It's hard to slow down. I appreciate my family more than ever. Trent is a dear to take care of half of everything I can't do. David and Eddie have each made dinner this week (er, helped, but they are getting better). Angel unloads the dishwasher. The twins cleaned the bathroom, and it is actually cleaner now than when they started! Even Chris was kind and was willing to help out (when he's not at school or work or track - which is not very much). I'm blessed with wonderful people around me. So we'll see what lessons I get to learn from this adventure! Patience, I'm sure. And gratitude. And being able to see the things in slo-mo that I miss on fast-forward. Stay tuned... I'm not going anywhere! And thanks, Lord, for giving me a heads-up there at the organ. I appreciate that. I spent some time out in the sunshine today, weeding and thinking about our current political climate. The two went really well together., actually. Whenever I thought about a politician, I ripped out a weed. Very cathartic and energizing, somehow at the same time. 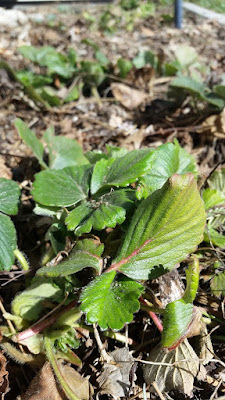 There is a small strawberry patch along the back of the house. I don't think I've ever seen it really flourish. My mother did not like to weed, and I don't think she liked anyone else to weed, either, so she just wanted to put the whole yard in grass and forget about it. I remember her making us weed lots when we were kids - I guess it wasn't worth the effort for her! 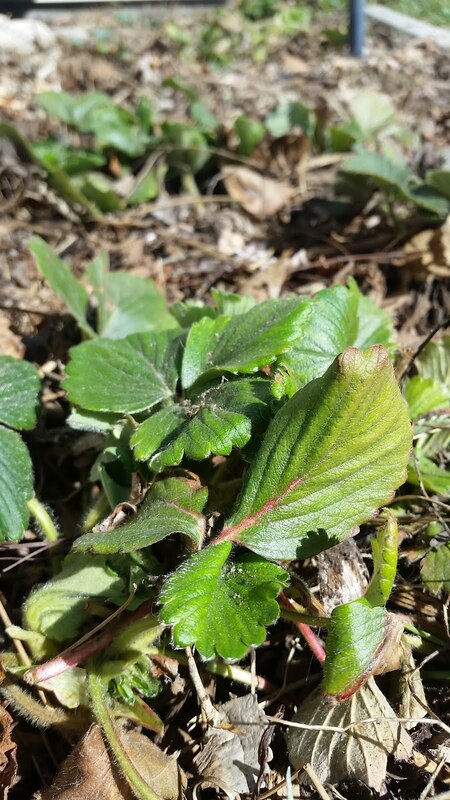 My brother and his sweet wife tried to tame the yard when they lived here, but it's a really hard spot to grow anything well. Most of the strip is only about six inches wide, right against the south side of the house, so everything there just bakes. Except the grass, the dandelions, and the bindweed. The honest truth is that we can never give up on making life better. And that's not a bad thing. I am glad for the excuse to sit in the sunshine today. After the twins told me two good things and one bad thing about their day, Freddie asked if he could tell me one more bad thing. "Sure," I responded, "as long as you tell me another good thing, too. " He told me the bad thing (Georgie had poked him with a pencil), and for the good thing, announced that today was library day. Their kindergarten class went to the library and got to listen to the librarian tell them stories. "I love hearing stories! It's just like bedtime except we get to wear shoes!" Angel was telling me about how Grandma Susie had a bad diet and that she died from it. "And now she's in Heaven, so that's a good thing." She paused. "You know what the good thing is about when Opa dies?" She plunged on enthusiastically. "He'll be with his wife again!" She was so happy and sighed in rapture. "I just want to kill him right now!" The flowers are coming up, the snow is melting, we are putting another bed in Chris's room, and Alec wrote a longer letter this week than the normally-longer-winded Ben. Always something new! Ben told me a funny story about a drunk guy they encountered who kept telling them that he loved them. "The one thing that makes me have a good day no matter what is finding something to laugh about. There's lots of good things out there and when I am good at laughing, I'm way happier. Isn't that great?" Alec has no car, I think for the first time on him mission. That may have something to do with his recent birthday and the expiration of his driver's license. So he's riding a bike, and I hope he really enjoys it! He loved biking before his mission, but I'm sure riding for transportation is much different than racing them. Jump over to Alec's South Africa blog or Ben's Madagascar blog. As I slow down, I am realizing that I am not a one-man-band. The universe does not revolve around my efforts. I am not indispensable. And contrary to how I often feel, I do not carry the entire weight of the world in my poor arms. Instead, I do my little part and those around me do their parts and we all manage together. None of us are perfect, but we manage to make things work in spite of our mistakes. Nowhere is this more true than at the junior high band concert I attended tonight. Eddie plays the trombone in the beginning band and I went to cheer him on. I'd really rather have stayed home on the couch, but if I stayed, I would have been on for dinner patrol. I gladly let Trent manage the last part off dinner prep, getting everyone to the table, the happy chaos of eating, and the cleaning up. For my part of parenting duties, I'm sitting comfortably in a padded chair, listening to the different junior high bands. They aren't as painful as I remember from when I was in junior high and for that I am grateful. As the beginning band stayed up, a single clarinet came in a count to early. An oboe squawked and the low brass played heavily over the top of the woodwinds. A tiny girl crashed cymbals that were nearly as big as her arms were long, and she struggled to stay on beat with the heavy metal cymbals. The snare drummer executed a lopsided drumroll, and a single note from the bells sounded out clearly during what should have been a quiet part. At the end of a song, a single flutist hung onto her note too long. But we all clapped enthusiastically anyway. We cheer them on because we see ourselves in these fresh-faced kids who are trying so hard to do a hard thing well. Most of them just started playing their instruments a few scant months ago. They might not have known how to read music, or have had the strength to hold up their instrument more than a few minutes. But they keep practicing. Every honest try earns a modicum of improvement., a smidgen of skill. And together, they get sounding pretty good. The second band plays, then the third. Each band is more practiced, more sure of themselves, more skilled. They transform the tunes into heart-moving music. They grow into musicians. And they touch our hearts. We applaud them and hope that somewhere there are cheerleaders for us as we keep trying to do things that are hard for us - things that we aren't yet as good at as we'd like to be. I do my little part and you do yours, and together we make something worth listening to. Lessons From the Organ - Slow Down! Oh, that was hard! I've always had a thing about music with a slow tempo. I chafe at singing hymns at church that should be bright and perky but instead drag into a boring cesspool of dead tones. Yes, I feel that strongly about it. I don't know why church organists often feel that the correct tempo - for everything - is "moderate funeral dirge." I work hard to learn the weekly hymns thoroughly enough that I can play them up to speed, or maybe even a little bit faster. "Onward Christian Soldiers" should make you feel like marching, not lull you into taking a nap! I've been guilty of being harsh and judgmental. I remember singing way-too-slow hymns at church and looking at my watch to figure out just how slow they were going. Jay, always the kind one, would smile and shake his head at me and tuck my arm in his or hold my hand - covering my watch. And now, I'm the one playing oh-so-slowly. It's rough. I just like to tear through a hymn and get to the end. I like to have people sit up and take notice and sing out. I like to play cheerfully or strongly. Isn't this picture gorgeous? It was taken by the uncle of Alec's girlfriend and you really ought to look at his other temple shots. They are breathtaking and show just how I feel when I go to the temple. In the temple, the whole mood is different. Everything is hushed and peace reigns. A loud, sprightly hymn would be out of place. I love the serenity that fills my heart and smooths out all my rough spots, and I wouldn't want to spoil that tranquility for anyone else. My job there is to add to the beautiful spirit, not draw attention to myself or encourage action. I'm so grateful I get to go to the temple. I love it. I love the feeling there, and I love playing the organ. But it is so hard to play slowly! As I struggled to keep the tempo sedate, I wondered why it was so hard for me to slow down. As I thought and thought and pondered and wondered, I finally learned what I needed to know today. Yes, I CAN go fast. Yes, it is fun to sing out. Yes, it is invigorating to play briskly. But right now, I need peace. My life has enough and I'm not always coping very well. So slow down, girl. Breathe a little between verses. Smell the fresh nearly-spring breeze. Hold on to those notes. Hug your children longer. Notice the beauty. Feel the sunshine on your hair. Pause. Slow. Walk. Rest. Enjoy. 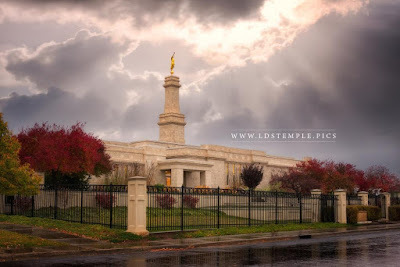 For more information about LDS temple - why we build them and what we do in them, as well as some lovely pictures inside - read this article. I know Alec's blog hasn't been updated for a while. Sorry you don't get to hear some of the adventures he has been up to! It stopped at week 86, so I haven't thought for a while about what number he might be at now. I think it is actually about 100, and that is just crazy. How in the world can time go so quickly? He'll be home soon, and I'm doing a lot of reflecting. I've missed him. I've missed his strength and his perseverance, his tenderness with his littlest siblings, and that dimple when he gets mischievous. It goes against common sense, but in spite of all the distance and everything, I love that boy more than ever, It will be nice to have him back home. Now I need to go figure out where he is going to sleep! You can catch up on the Madagascar blog too, which is already at 86 weeks. How?? We had Dad's other eye scheduled for cataract surgery this week. That makes it sound like we could just pop the eyeball out, send it in for refitting, and then pop it right back in. Wouldn't that be nice! But no, his whole body was required at the cataract surgery. Too bad. At any rate, the second surgery hasn't happened yet. That left eye just is not seeing well enough and we don't want to take out the good eye. I mean, not take out. Just put it out of commission for a while. It would be nice to be able to see out of the left eye before they operate on the right eye. The left eye is improving, but more slowly than they wanted it too. Right now, with best correction, he can see 20/1000 out of it. And that is an improvement! So we'll just wait and see. I'm hoping all these procedures help with his... seeing things that aren't there. I don't know whether it is the Parkinson's (hallucinations are not uncommon) or his vision, but I'm guessing it is a combination of bad vision and his poor brain trying to make sense of it. He sees "curtains" or "strings of dust" all over, but particularly in his bedroom. Sometimes big strands follow him out, evidently. Sometimes they are gauzy and thick around the windows. Other times they are thin cobwebby strands over his train set in the garage. Sometimes they are sparkly and glittery, and he says they can be very pretty. He says that when they build up it is hard for him to breathe, so he has to leave his bedroom door open all the time. He brought me his magnifying glass the other day so I could look at the dirt under his fingernails because that is what it looks like. He's pretty frustrated with me that I can't see it and feels like I don't believe him. I'm guessing that the left eye, the one that can't see well, is still sending occasional shots of light and he can't make sense of those sparkles. Also, it may be like looking through smeary glasses where you see halos around lights or shoots of light coming from the windows. Strands of dust, as it were. His brain connections might not be able to make sense of it and interprets it incorrectly. Or it's a combo of that and Parkinson's. We shall see if it gets less "dusty" for him when his eyes are working properly. I spent a few hours deep-cleaning his room the other day to get rid of all the "dust." I cleaned his bathroom with a toothbrush (and had problems with chemical fumes for several days afterward), dusted everything, wiped the baseboards, cleaned the ceiling fans, moved everything and vacuumed thoroughly .I got out the air purifier to clean the air and sprayed air freshener. After I was all done, he sat back and said, "There. Now do you see them around the door there? It is really thick with dust all the way around it." Can't win there. All I can say for the cleaning is that I'll need to do it more often (he has been insisting that he could do it himself) because it was nasty. Maybe when I'm an old lady, my world will be beautiful with sheets of light and sparkles. Or maybe my eyesight will be bad enough that I won't be able to see the real dust that is there so I won't have to clean. Either way, it's a win!